Puente Romano Hotel is renowned for attracting International music stars from around the world and now once again they presented an incredible evening of musical excellence. Following the success of the first World Vision Gala in August 2013, they continued to raise funds specifically for the Education Project in Phonsay, Laos. 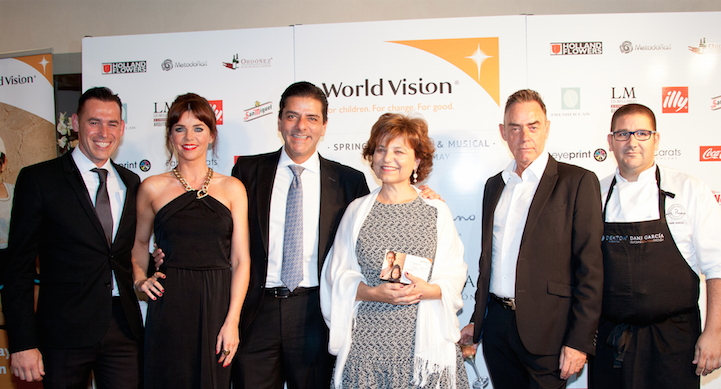 The World Vision Gala took place on Monday, 23trd of May, in the beautiful Hotel Puente Romano. Hotel Puente Romano in Marbella presented a wonderful musical evening in aid of International World Vision Charity on Friday 23rd May, to support WVF's Laos education project. The evening started at 8pm with a welcome cocktail in the beautiful Patio Andaluz serving a selection of canapés prepared by Dani García. The gastronomic journey continued once guests were seated in the Salón Andalucia, a 4-course gala dinner prepared by the award winning Executive Chef Thomas Stork. Wine was chosen by our sommelier to compliment the cuisine. Live entertainment for the evening featured the extremely talented Peet Rothwell performing the best of Michael Bublé. His smooth voice and charm was just the perfect compliment to the elegant surroundings and cuisine. has been remixed and played at every party since, resulting in an anthem that will have everyone hitting the dance floor. Her incredible voice and variety of tracks created an electric atmosphere. The evening culminated in a performance by D&Co singing music of The Commitments. Guests were encouraged to take to their feet to the fantastic hits of ‘Mustang Sally’, ‘Take me to the River’ and ‘Try a little Tenderness’. Proceeds of the event were donated to the World Vision Charity. Puente Romano Beach Resort supports World Vision charity all year round by asking guests staying in the hotel to donate 1€ per night to the foundation, the hotel then matches the amount donated by guests. On behalf of the children of Phonsay, ADP whose lives you will help to transform, thank you for your interest in this project.